Circe was drafted as a coastal watch boat in the event of an invasion. From Neah Bay to the mouth of the Columbia, Circe and her crew kept watch on the horizon for another ‘surprise’ attack. 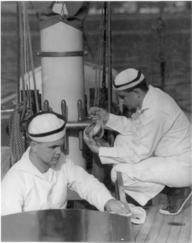 Circe’s hull was painted blue, flying the stars and stripes as a U.S. Coast Guard Auxiliary fleet during those war years. 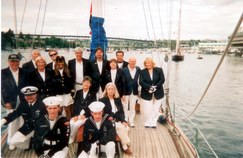 Following Circe’s restoration, she regained her status with the Seattle Yacht Club in the 1990’s not as the ‘scratch’ racing yacht of the 1930’s, but as a training experience for ROTC Naval midshipmen attending the UW. 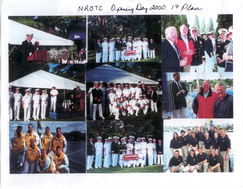 For more than 10 years, Circe served as the sail training vessel as required for ROTC Naval midshipmen. 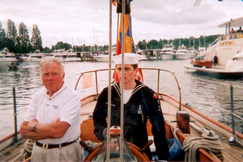 Stan Keck (U.S. Navy Col ret) brought instructors from the Naval Academy to train SYC volunteers who could provide ROTC candidates their required instruction for certification – without waiver. 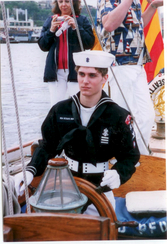 UW ROTC graduates did not require a ‘waiver’ following their training experience on Circe as the Navy’s only commissioned officers with actual sail experience.